Power is not won by losing it once again. We help you harness wind energy; off-shore wind energy presents the most promising opportunity for the generation of ‘green energy’. Marine Service draws on its five decades of technical and commercial experience in the maritime industry for the construction of special converter platforms for the operation of offshore wind parks. Pioneering solutions – we can show you how to convert know-how into energy. Offshore wind parks generate their green energy in the form of alternating voltage. By means of special converter platforms, this voltage is converted to direct current. This cuts down the losses in energy transmission through the power lines running across the seabed. For the efficient use of this ‘green energy’ generated through offshore wind parks, Marine Service has developed many special solutions and services for the installation of converter platforms. We assist you with the design concept, preparation of specifications, review of design drawings, approval procedures and with project management and supervision of the offshore installations and the technical platform management for such projects. We also plan all maintenance activities to ensure the smooth operation of the platform. 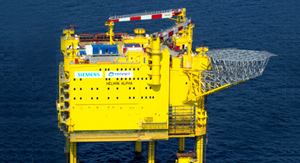 HelWin1 – First power supply grid: In the East of the North Sea, a 576 MW direct-current grid connection for wind parks was installed off the coast of Helgoland. Project status: The completion of the grid connection is scheduled for the end of 2014. 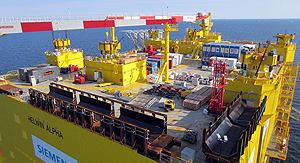 After the construction of the platform, Marine Service also supervises the installation of the topside on the base frame. We also manage its operation and maintenance, on request. Marine Service is your expert partner starting from the planning and design phase.